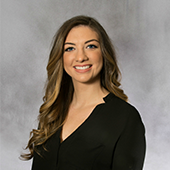 Madissyn Fredericks earned her Masters in Counseling from Northwestern University and her Bachelor of Science in Psychology from The University of Iowa. While obtaining her Master’s degree, Madissyn trained at The Family Institute and Urban Balance, working with young adult and middle-aged individuals addressing a variety of issues to help them move towards success and happiness in their lives. While her foundation is based on a psychodynamic approach, Madissyn also incorporates interventions from cognitive-behavioral and strength-based theories, tailoring it to each client’s unique set of needs. Madissyn offers guidance and expertise in addressing an array of issues that impact individuals, couples, and families, including depression, anxiety, relationship issues, pre-marital counseling, low self-esteem, grief/loss, work-life balance, and life transitions. Her hope is that, through the power of the therapeutic relationship, clients experience their authentic selves and take the experiences and lessons from within the therapy room and apply them in their daily lives. She works to provide a safe, empathic environment to promote and facilitate change in the lives of her clients.